"The partition table format in use on your disks normally requires you to create a separate partition for boot loader code. 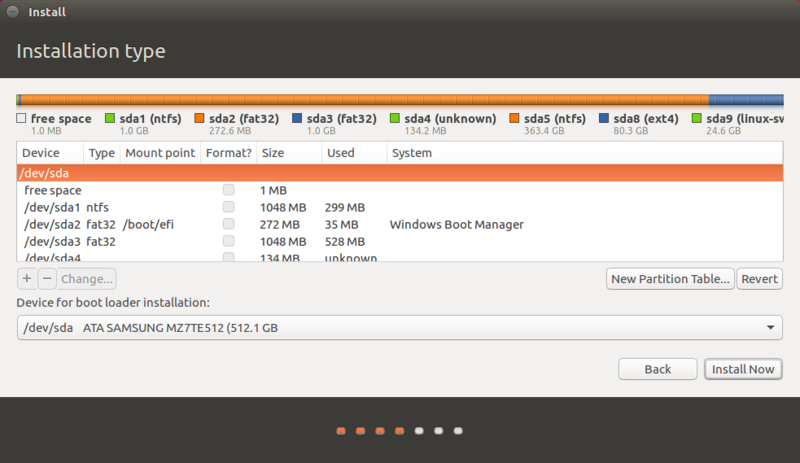 This partition should be marked for use as an "EFI boot partition" and should be at least 35 MB in size. Note that this is not the same as a partition mounted on /boot. If you do not go back to the partitioning menu and correct this error, boot loader installation may fail later, although it may still be possible to install the boot loader to a partition." I am not sure how to fix this problem. I have included a screen shot of both Gparted and the Installation type page. If any more information is needed to solve this problem please let me know. Thank you. Browse other questions tagged boot dual-boot partitioning upgrade uefi or ask your own question. Ubuntu installation error: Reserved BIOS boot area partition?What to do to continue installation?